I've been in two minds whether to post this or not, this layout may not get past the drawing board. I have struggled to find some details so I am hoping for some help to fill in the blanks. A while ago I decided to split my modelling interests in the Caledonian Railway and the LNWR into the two scales I model, 7mm & 2mm. I selected 2mm for the caley as the line I'm interested in would benefit from a more expansive approach to incorporate some of the line side scenery. That was before the 2mm coal tank project, being 2mm and LNWR I felt I should support, I had toyed with the notion of doing something in North Wales. The LNWR branch lines have always held an interest, in particular the lines on Anglesey to Red Wharf Bay and Almwich. However, having three layouts on the go would split my attentions too much and nothing would get done. Ideally I need something I can run both CR & LNWR trains on, clearly the house styles of each company would not look right with the others rolling stock. I did ponder a joint branch line somewhere on the borders but this felt a bit false. I have a space about 7' x 9" so a BLT would suit in 2mm. About 25 years ago a relative bought me a book entitled "Tales from the Buchan Line". The book was interesting although the GNoSR as a prototype never really grabbed me. However two sections jumped out at me as offering modelling potential. The first was the Cruden Bay Hotel Railway. The hotel was built by the GNoSR in a bid to create a resort and traffic, the hotel and golf course was connected to the railway by a half mile 3'6" gauge line. The line was powered by overhead centenary and trams cars were used to collect and transport guests to and from the station, the line was also used to collect goods and coal from the station and move laundry and supplies around the hotel grounds. In 1916 the Admiralty was becoming increasingly concerned with the German U boat threat and developed a series of non-rigid airships, the NS class and later SS class to patrol the coast of Great Britain. These airships needed dedicated bases to fly from and the Admiralty commenced a building programme at various sites around the coast. Lenabo or RNAS Longside as it was officially known was situated three miles from the GNoSR station at Longside. Being relatively remote the contractor engaged to build the base laid a railway line from the station to the base complex. The RNAS obviously thought this useful as they kept the line once the base was open. Looking at the records a considerable tonnage of goods ran to the airbase, all worked by GNoSR engines. The base housed between 500 and 1500 staff (depending which source you read) so needed a fair amount of supplies just keep those mouths fed, coal for the base (also used to generate the gas for the airships), spare parts, petrol (in cans and barrels transported in open wagons) and munitions. The airships were also assembled on site, presumably also brought in by the railway. Additional passenger trains moved the troops in and out of the base. The track layout in the book doesn't quite match the descriptions, it is described as three loops. Two are shown turning to run right angles to the approach track. One ran to the Airship shed the other to the power house and gas holders. As mentioned the GNoSR never interested me. However what if the RNAS built bases served by the Caley and the LNWR? Well as luck would have it they built one at Llangefni, about three miles from the LNWR's Almwich branch on Anglesey (sound familiar). It was never rail connected but, what if it was? The other location will be North Connel, there is an airstrip there today (grandly titled Oban Airport) and Oban and Kerrera were used as bases by Coastal Command during WWII so the site is feasible, albeit the RNAS never built a base here. The relocation gives the option of running trains form both companies into the base. The infrastructure will be Standard RNAS and not tied to any particular operating company. The branches were operated as one engine in steam so no signalling equipment required. With the centenary of these bases approaching (they became operational in 1917) I think the model would offer a nice variant to the BLT standard. I will post more details as the plan develops, however, I am struggling to find details of the infrastructure on the bases. Most, if not all, were demolished in the early twenties so only had a life span of 5 years. There appears to have been some industrial infrastructure to generate the gas on site, although I've not found any details. I am also on the look out for any books relating to the bases or airships. Edit:- I've just realised the Airship Station was RNAS Longside, not Longsite, so the above has been changed accordingly. Well, it has my vote. I had myself thought of an 009 railway serving a seaplane base (based on Calshott), actually, this is something my son wanted me to do, but would pale in comparison with what you have in mind. An airship base served by pre-grouping standard gauge railways would be EPIC. First, build your airship: https://ospreypublishing.com/british-airships-1905-30 ! I'd missed that book which has been duly ordered! The sheds were over 300' or 600mm in 2mm extended by windbreaks of a similar lengths to enable the airships to be moved in and out of the sheds without being affected by gusting winds. These structures will form a great backdrop to the base, with suitable rail loading bays on the airship shed. I've found views of these structures, although happy to receive more! What I am really lacking is details for the gas generating plant and power house. Both these were rail served at Lenabo so would need to be modelled in detail. I'm also planning to include some fixed wing aircraft. During my research I found that a flight of six DH4s were based at Llangefni, I enjoyed building aircraft kits in my youth so this is a definite plus! Whilst no kits exist for the DH4s yet, Valom (http://www.valom.net/modely_en.html ) have introduced some 1/144 WW1 aircraft kits. I have a Sopwith Pup kit (2 planes in a kit for £7.50!) waiting beside the workbench. The kits are plastic with etched brass details which look suitably delicate. By the end of WW1 the Pups were relegated to Officers "pets" (private transport) and trainers. I've found some interesting paint schemes to test my painting abilities. Hopefully the DH4s will make an appearance before too long. I'll keep a look out. In the meantime, have you seen this doctrinal thesis that looks right up your street http://www.dtic.mil/dtic/tr/fulltext/u2/a425512.pdf ? This looks like a very interesting project. I will have a look through my collection of WW1 books when I get home from work later and see if I can find information about RNAS airship sites. I know I have a couple of autobiography's from people that served with the RNAS so hopefully I'll find something usefully for you. If you google "RAF Cardington" you get some useful leads on airship sheds, etc., and they're still there now, very visible across the Bedfordshire countryside. (Just as well this is 2mm. we're talking about.) The one shed, no.2, came from RNAS Pulham, in Norfolk. Maybe even Pulham Down?? If you're building old airplanes to go with it, can I put in a plea for a "Felixstowe" flying boat, which I think looks magnificent. Then there's L&Y coaches converted to carry aircraft... All in all, your idea has great potential, good luck with it. Thanks for the help so far gentlemen. I'm slowly working my around the airship sites in the UK via Google and building a reference library so hopefully the model will be an accurate representation. As regards fixed wing aircraft, I am trying to avoid the "museum" look you sometimes see where there is one of everything on the model rather than an accurate representation of an operational base. That said, I do find the early Felixstowe and Short seaplanes irresistible. Red Eagle miniatures produce some in 1/144 scale for war-gaming. Perhaps some will be flying overhead. The "dazzle" camouflage scheme would be an interesting challenge in 2mm! I'm intrigued by the L&Y coach conversions, do you have any more information Northroader? Argos, I see a 1/444 scale DH4 on that page! The smaller Red Eagle models are cast in white metal and look a little crude compared to the Valom kits. I might get one to see, It is always hard to judge with such a small scale, blow up photos can be cruel. Look for "Wings of Glory" WWI miniatures. These are 1/144 scale and come complete and painted. They would only need a little detailing and weathering to produce an excellent model. The range is enormous and is about to include the giant Handley Page bombers. This sounds like a great idea, just when you thought there was nothing new under the (railway modelling) sun. If it was me I would do it in 009 but then it would need to be enormous but you can put in as much detail as required and possibly an actual airship. The clip looks interesting I'll have a view tonight when I've got a bit more time. I did contemplate modelling the airships, a kids tubular foam float would be a suitable former to form the shape, a covering of silver foil would represent the skin. The trouble is the size, even the small NS ships would be 520 x 120mm, given I'm trying to compress the scene into 7' x 9" it would be a squeeze. If I deepen the scene I could have nose sticking out of the hanger. Failing that one in flight overhead might be a possibility. I've had a look through the books that are easy to get to and my DVD collection and at first glance I can't even see and references to Airship bases however being curious and looking on the internet to learn more about them lead me to this gallery on the BBC website which includes a nice arial shot of RNAS Pulham. I will see if I can find the rest of my WW1 books at the weekend. The photos on that site is the nearest I've come to seeing the gas production plant. The carriage conversion looks interesting, I might attempt one of those. On a different note, most of the conversation to date has revolved around non rail items, so I suppose I should get back on topic! The line to Lenabo is recorded as handling in excess of 31,000 tons of freight in its life time. This was basically from 1917 to 1919 when the base was mothballed. The site was sold in 1921 and the line removed in 1923. I suspect little if any traffic passed over the line following closure of the base. So this gives about 10,000 tons per annum during the operating years of the base. Which works out at around 30 tons a day. If we assume an average wagon load of 5 tons (mineral traffic would be heavy, general goods lighter) then this would be 6 loaded wagons in and 6 empties out. It is unclear whether Lenabo had a dedicated engine for the branch, some reports indicate it had, but it may be there was some confusion with the contractor's loco used in building the base. GNoSR 4-4-0 tender engines certainly worked the branch as one was involved in a fatal accident at a level crossing on the line. This gives the flexibility of having a small dedicated engine, the mainline pick up goods stopping by and a dedicated working. Goods traffic would be pretty much everything barring mineral (Coal was required though) and cattle/sheep workings. Presumably most Pre-grouping companies would be represented as I believe wagons were pooled during the war. Passenger traffic can be handled by a small carriage requisitioned for the line, possibly run as a mixed train. Large troop movements would bring in mainline stock and suitable larger locomotive. There is no platform, any carriages will just be pulled into an available road, the passengers presumably just jump down, or some wooden steps would be available. Below is the first attempt at a track plan, It's done in AnyRail, once fleshed out I'll convert to Templot to generate the 2mm FS templates to build the switches and crossings. Looking at the plan, my reaction is if you're in 2mm, expand the space around to leave plenty of room for some of the RNAS items that would be surrounding the tracks? That could pass for a regular town gas works at Pulham - great find, Gary. There is an photograph on the net, variously said to be Longside and East Fortune (apparently the general arrangement was similar) which shows what I would take to be gas holders, though it's admittedly lacking in detail. Another thing to consider is depicting a deflated blimp by the hangar. I have now seen several photographs showing them in this state. It would save space and fulfil the current finescale trend for modelling scenes in which nothing is happening! I agree with the observation about the space, a more expansive layout of the base would add non railway interest. The intent was a small layout that could live in the house so would be restricted to what can realistically fit on a shelf in our room used as a study/modelling room. The length of 7 feet is a maximum and 12 inches would be the ideal maximum width, the plan above is 9 inches so a bit of expansion is possible. Great photo, the layout of the hangers is the same as Lenabo, but the plans I've seen have the gas plant and the barracks parallel with the hangers. I would suspect the railway would also be visible, so I suspect this is East Fortune. It also looks like the main hanger building (built to house the NS type airships, the smaller ones housed the smaller SS type) has been painted in camouflage colours, I've not noticed this before. Albeit it from a position of relative ignorance, I would concur. The absence of the railway line suggested East Fortune to me, a point not considered in the online debate I read concerning which location it represented. I should point out that reading a railway history and spending a few days footling around the internet doesn't render me an expert either! Still the research and learning is all part of the fun! The first of my airship books has just arrived "British Airship Bases of the Twentieth Century" by Malcolm Fife. It should keep me entertained for a few hours. Ok, Contrary to my post above and, just to prove my non-expert status, the areal shot provided by Edwardian above is definitely Lenabo (Longside)! A similar view is repeated in the British Airship Bases book. The base at East Fortune was also rail served so any visible railway sidings wouldn't have helped! For those who've suggested a narrow gauge line there are a couple of scenarios for this. The base at Caldale on Orkney had a short narrow gauge line during the construction of the base. There is one photo showing the line which appears to be standard WD stock and rail panels. The other was a proposed refueling point in the Cocos Islands in the 1920s. The station would be built on an uninhabited island 5 miles by 850 yards. A jetty at one end of the island would connected to the airship station by a light railway line to bring in supplies, petrol and coke for gas generation. The Cocos islands are about half way between India and Australia in the Indian Ocean. Fascinating. Which company served East Fortune? I realise I have been there; it is now the Scottish aviation museum and is a very well preserved WW2 station, but with nothing left of the airship infrastructure. The book, unsurprisingly, focuses on the airships the railways serving barely get a mention. The line serving East Fortune is described as a "short branch off the main Edinburgh to London Railway" so I would suspect the North British would have worked this base. The book is not infallible though, the base at Cramlington, near Newcastle, is described as being just off the London-Edinburgh railway and served by the Great North Eastern Railway. I'm presuming the "Great" is mistake. 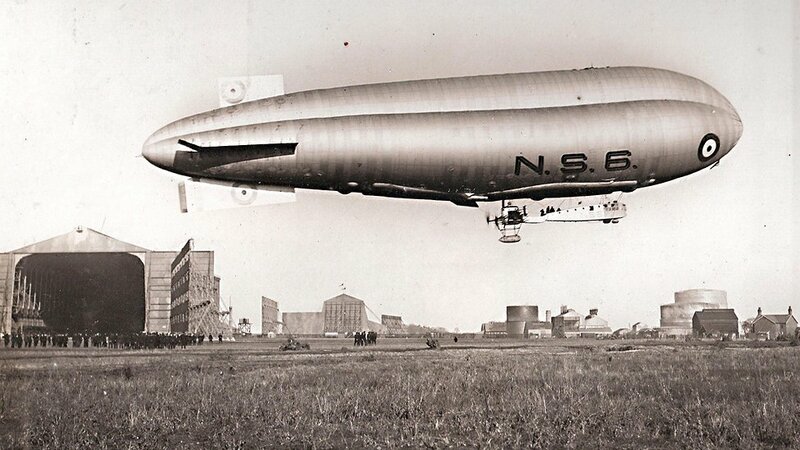 In fact several of the bases and airship assembly plants were rail served. I'll make a list and post it later. The North Eastern Railway was Great. Fancy you not knowing that. Just pondering this evening, and I was thinking gas producing plant. Of course it wouldn't be "town" /"coal" gas they'd be making, would it? They'd want hydrogen, and how did we do this in the chemistry lab at school? God knows, it was a long time ago, I seem to remember acid being involved, so presumably you'd need some nifty p.o. Chemical wagons on the sidings. More lines of research!